Crystal Palace and Brighton fans have set aside their differences to help a little girl raise the money needed to help her walk unaided. 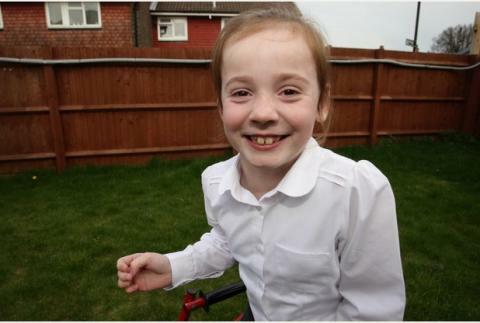 The parents of cerebral palsy sufferer Scarlett Hewitt, 8, of New Addington, last week appealed for help in their battle to raise £65,000. The money would be used to fund life-changing surgery at a leading American children’s hospital. After friends of her Eagles supporting father, John, posted the Advertiser’s story on Crystal Palace fans’ forum the BBS, donations shot up. But what Mr Hewitt and his wife Lisa did not expect was the response from supporters of Palace’s rivals Brighton and Hove Albion. The story was posted on Brighton forums and the Seagulls fans have since added more than £1,000 to Scarlett’s JustGiving page. Mr Hewitt said: “It’s quite amazing really, it’s great that both sets of fans can get together to help a good cause.